The Nexus 6 has got 2.7 GHz quad-core processor built on Qualcomm's Snapdragon S805 chipset and is paired with 3 GB RAM. For Nexus 6, Google has worked with Motorola and the design looks identical to Motorola's Moto X 2nd Generation. Weighing 184 grams, the Nexus 6 has got a six-inch quad HD display with 1440x2560 pixel resolution and 493 pixel per inch density. Everything looks bright and crisp on this screen. There is an aluminium frame running around the edges. The rear panel is non-removable. It has the camera lens with a circu-The camera interface needs some time to get the hang of it. The camera locked the focus instantly and the still images looked good. My review unit had 32 GB internal storage, out of which 25.98 GB was user accessible. And it doesn't support expandable memory card. The Nexus 6 lasted me a day on a single charge when used carefully. But it did heat up when used for heavy graphic apps for longer duration. private data such as photographs. More profiles can be added to the phone. The icons look different and refreshing. There are three folders on the home screen - Google, Create and Play. The typical capacitive keys for home, back and multitasking have got geometrical designs. The back key is a triangle, home key is a circle and square is for multitasking. The 13 MP camera with the dual LED flash in the ring works well. lar LED flash followed by Motorola's M logo and the Nexus branding. The SIM slot is placed on the top. While I could navigate through the phone using one hand, I often feared dropping it. 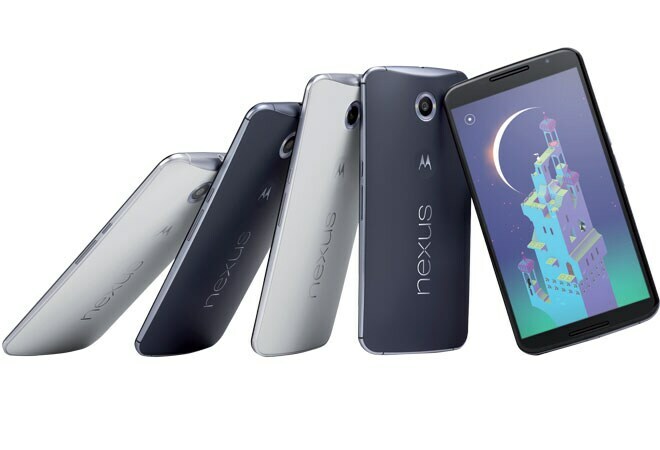 The Nexus 6 packs in the highend latest specifications. It has got 2.7 GHz quad-core processor built on Qualcomm's Snapdragon S805 chipset and is paired with 3 GB RAM. This is good enough for the phone to multitask with ease and handle heavy graphic games and multi-tab browsing. The text appears crisp and clear. unning on Android Lollipop, the interface looks different and refreshing. From the lock screen itself, I was able to launch the dial pad or the camera app. Swiping down the notification bar gives access to instant settings and also shows battery percentage, settings icon and user profile icon. Entering the guest mode allows you to lock down private data such as photographs. More profiles can be added to the phone. The icons look different and refreshing. There are three folders on the home screen - Google, Create and Play. The typical capacitive keys for home, back and multitasking have got geometrical designs. The back key is a triangle, home key is a circle and square is for multitasking. The 13 MP camera with the dual LED flash in the ring works well. The camera interface needs some time to get the hang of it. The camera locked the focus instantly and the still images looked good. My review unit had 32 GB internal storage, out of which 25.98 GB was user accessible. And it doesn't support expandable memory card. The Nexus 6 lasted me a day on a single charge when used carefully. But it did heat up when used for heavy graphic apps for longer duration. A solid piece of hardware with Google's latest Lollipop operating system.